1-2 Remaining unstable with also some thunderstorm on the 2nd, mainly over Ardennes. Temperatures above normal with values between 13-16°C. 3 Showery rain between 0430-0600 giving 4 mm. Partly cloudy to cloudy with Cu Sc, during afternoon a couple of light rain showers. Top Tmax: Kleine Brogel 14,1°C, Zaventem had 13,2°C. 4 Partly Cu cloudy, in afternoon a couple of light rainshowers. Top Tmax: Kleine Brogel 12,4°C, Zaventem had 9,2°C. 5 Tmin in garden 0,5°C with hoar frost. Quite sunny, in afternoon around 1400 passage of a moderate soft hail shower on which T dropped to 3,0°C. Top Tmax 11,0°C, Zaventem had 8,4°C. 6 Tmin in garden -1,1°C, lowest in Belgium Elsenborn -6,2°C & Brasschaat -2,9°C. Quite sunny with some Cirrus, in afternoon also tempo few Cu Sc. Top Tmax: Kleine Brogel 13,2°C, Zaventem had 11,4°C. 7 Partly cloudy to cloudy with Cu Sc. A few spots around 1630 & 2100. Top Tmax: Kleine Brogel 14,1°C, Zaventem had 10,5°C. 8 Cloudy with Cu Sc. Passage of a line with showers, including small hail, around 1450. Afterwards clearing skies with one Cb passing far north of my area. This shower gave a weak thunderstorm over provinces of Oost-Vlaanderen & Antwerp. Top Tmax: Kleine Brogel 12,8°C, Zaventem had 11,3°C. 9 Partly cloudy with Cu, in afternoon invading Ci Cs from SW. Top Tmax: Kleine Brogel 14,4°C, Zaventem had 10,7°C. 10 Tmin in garden 0,6°C and hoar frost. Partly cloudy to cloudy with Cu Sc. In evening some TCu with virga. Top Tmax: Kleine Brogel 13,2°C, Zaventem had 9,7°C. 11 Tmin in garden -1,3°C. Top Tmin: Brasschaat -3,9°C. Sunny start with Ci, later a few Cu clouds, in afternoon more Cs & As. First slight rain from 1900 on. Top Tmax: Kleine Brogel 10,5°C, Zaventem had 9,5°C. 12 Light rain till 0330 giving 3 mm. After a very cloudy Sc forenoon, breaking clouds from 1100 on, with scattered Cumulus remaining. Top Tmax: Kleine Brogel 15,1°C, Zaventem had 11,9°C. 13 Slight rain between 0500-0800. Very cloudy with Sc, clearing towards noon but soon Ci, Cs and As came along with some slight rain between 1500-1630. Afterwards remaining Sc overcast & very windy. Top Tmax: Kleine Brogel 16,2°C, Zaventem 14,1°C. 14 Cloudy to very cloudy with Sc but some nice breaks between 1000-1300. Afterwards overcast with light rain between 1400-2300 giving 3 mm. Top Tmax: Kleine Brogel 15,4°C, Zaventem had 13,9°C. 15 Misty and cloudy night. Further increasing Cs, As & Ac with light rain from 1630 on giving 5 mm by midnight. Top Tmax: Liège 15,6°C, Zaventem had 14,0°C. 16 Light rain till 0900 giving 4 mm. Remaining very St Sc cloudy with at first mist. A few short breaks around 1700. 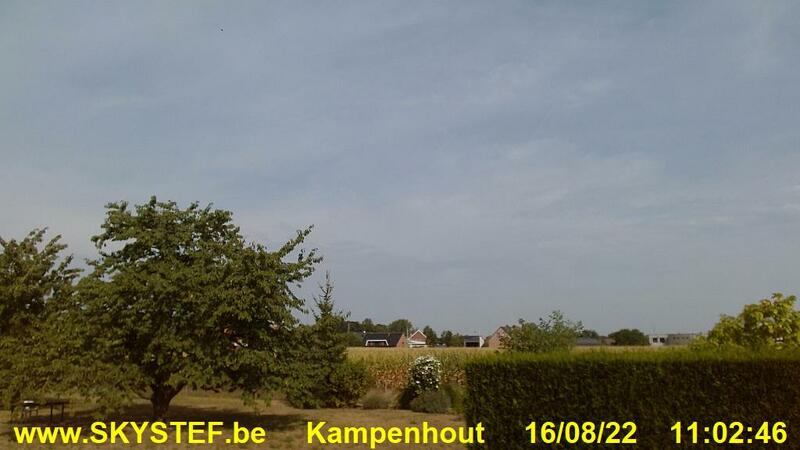 Top Tmax: Kleine Brogel 16,6°C, Zaventem had 14,9°C. 17 Slight intermittent rain between 0500-1000. Afterwards breaking Cu Sc clouds. Top Tmax: Kleine Brogel 16,3°C, Zaventem had 13,5°C. 18-23 No exiting wx conditions: remaining dry with a mix of clouds and sun. The 20°C mark was exceeded on 21: Kleine Brogel had 21,8°C, other stations (but one, Diest 20,3°C) remained just below with for example Zaventem 19,8°C. On 23 some sharp frost over the Campines: Brasschaat had -1,4°C. Also in my garden hoar frost with an air T of barely 0,2°C. 24 After some light rain during the night, a quite sunny day, later in afternoon some Ac fields coming in from S. Top Tmax Kleine Brogel 21,1°C, Zaventem had 18,8°C. Several mid and eastern stations went above the 20°C level. 25 Sunny start, after 1300 formation of Cu gradually also more high & medium level cloudiness came in but remaining dry. Top Tmax: Kleine Brogel 25,2°C, Zaventem had 20,9°C. In afternoon some weak to moderate thunderstorms did occur over provinces of Luxembourg, Liege and the eastern edge of Namur. 26 Light rain & drizzle between midnight and 0800 giving 2 mm. Afterwards remaining St overcast lifting to Sc and breaking from 1500 on. Top Tmax: Kleine Brogel 20,1°C, Zaventem had 16,5°C. 27 After a misty night, very cloudy with Sc, tempo some nicer breaks between 1230-1600 with Cu. Top Tmax: Kleine Brogel 18,9°C. Zaventem had 16,9°C. 28 Mix of sun and Cu Sc clouds. Top Tmax Kleine Brogel 17,4°C, Zaventem had 13,6°C. 29 Tmin in garden 2,0°C with even local hoar frost. Again rather sharp frost over the Campines with at Brasschaat -0,7°C in the air. Cloudy with Cu Sc, later also a few TCu Cb calvus with one light rain & small hail shower around 1415. During the evening incoming "Jet Cirrus". Top Tmax: Kleine Brogel 12,6°C, Zaventem had 11,2°C. 30 During the night a couple of rain & small hail showers giving 3 mm. Also during the day rather cloudy with lots of TCu & Cb virga but few precipitation. After 1800 clearing skies but incoming Ci from west. Cold day with top Tmax of barely 11,2 at Ghent & 10,0°C at Zaventem. This morning over the hills a small cover of snow pellets on the ground was observed. In the afternoon also a few weak thunderstorms did occur over provinces of Oost-Vlaanderen, Hainaut & Liège.